Mummy, Wife and Chaos: Matalan Style Challenge. A spring wedding. I was thrilled to be asked to take part in this challenge for Matalan and alas a challenge it was. If you are a regular reader of my blog you will know that I like a bargain and Matalan has plenty of those. Choosing a outfit for my brief of 'A Spring Wedding' with a budget of £50 was harder than I expected. A outfit to me is the clothes, jewellery, bag and shoes. My problem is I am fussy and struggle to make decisions. My husband will happily confirm this! This is why (along with lots of other hurdles) I didn't take the option of changing my outfit when I was made aware that 3 of us had picked the same dress. After all it's how we style and wear a outfit that makes us different. Being the savvy shopper that I am, whatever I purchase I like to know I'm going to get good use out of it. There's nothing worse than a one wear wonder that remains unworn after its first outing. Regular readers of mine will know that I'm not a 'girly girl' and the outfit I've put together is very 'me'. I've steered away from the flowery look as although there's a stunning maxi dress in store I felt it was too easy a option and it took me very close to the budget. After all I love a challenge. This Lace Dress is pretty, girly and sooo comfortable. Navy isn't as harsh as black but yet it goes with everything. It's suitable for Summer without tights or leggings and in the Winter with. Not only that the style of the dress is just as easy to dress up as it is down, it looks great with Converse or ankle boots for instance! It really is a great key piece to any wardrobe. The necklace was a bargain from the sale at £2.50, although only silver remains onlinethe stores had stock of gold when I last looked. 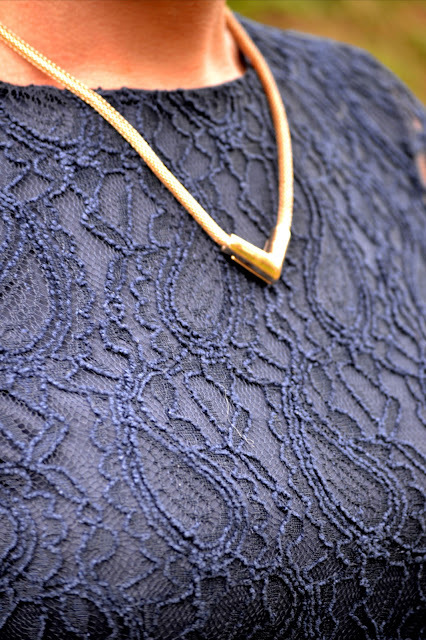 The gold sits well against the navy and being slightly chunkier it gives the pretty lace dress a edgier look. Which is right up my street. Not only that it would look super cute alone with a tshirt. Then there's the 70's style wedges that I hunted to the Matalan earth and back for and my persistence paid off. The block heels are still very much having a moment in the fashion world and these wedges although high, being a platform are easy to strut your stuff. These particular ones come in black or tan and the fact that they appeared in Closer and are a cheaper version to what Topshop and the likes have on offer means they are in hot demand. In my opinion the 70s vibe of these platform's really rocks the dress and you can get so much wear from them with maxi dresses, skinny jeans and flares. Come winter just add tights or ankle socks. Perfect! A) it matched my necklace and the gold buckle of the shoes. B) it stands out against the navy dress and tan shoe's. C) I loved that its a good size AND it's a zip! No more losing your lippy whilst dancing the night away. Let's face it girls a gold clutch would jazz up any outfit. You can only find black online but gold is plentiful in stores! So there we are girls my Spring Wedding outfit at £50.50p. Yes I went very slightly over budget, but what I have put together is 4 very wearable items that won't be gathering dust! You can vote for me by adding your comment here! Thankyou! You absolutely nailed it! Fabulous - and the colour really suits you too. Love ( need) those shoes!! Thanks! Shoes are pretty cool huh! Love the outfit - the navy and gold are perfect together. My first Matalan purchase was my silver brogues (which obviously mean a lot to me!!) and I always seen to find something different at a great price! Miss their Be Beau range though! Gorgeous dress and you've styled it to perfection! Those shoes look so expensive and not something you would expect to find in Matalan! Thanks. The shoes are sold out again!